What can I find in the portal „Teßmann digital“? How to search the portal? Whom can I ask for help? How did the portal develop? 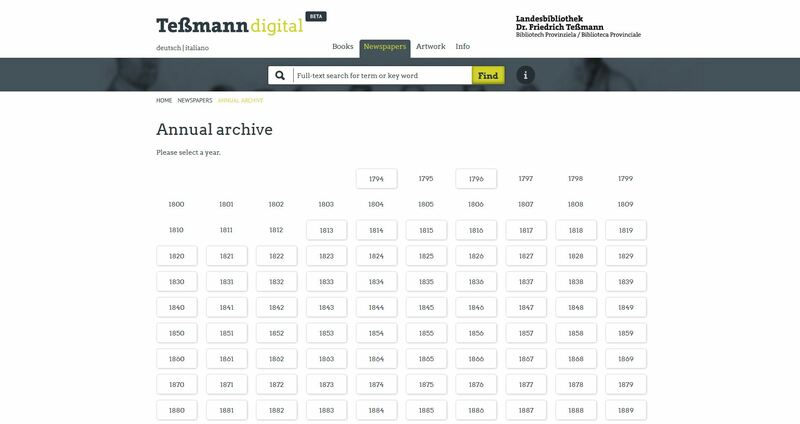 The collections offered in the “Digital Newspaper Archive” of the Dr. Friedrich Teßmann Library go beyond the collections of the Library itself. In collaboration with many partner institutions, especially with the Bibliothek des Tiroler Landesmuseums Ferdinandeum (Library of the Tyrolean State Museum Ferdinandeum), the Teßmann Library has completed its editions of historical newspapers and thus spares its users time-consuming trips to other libraries. 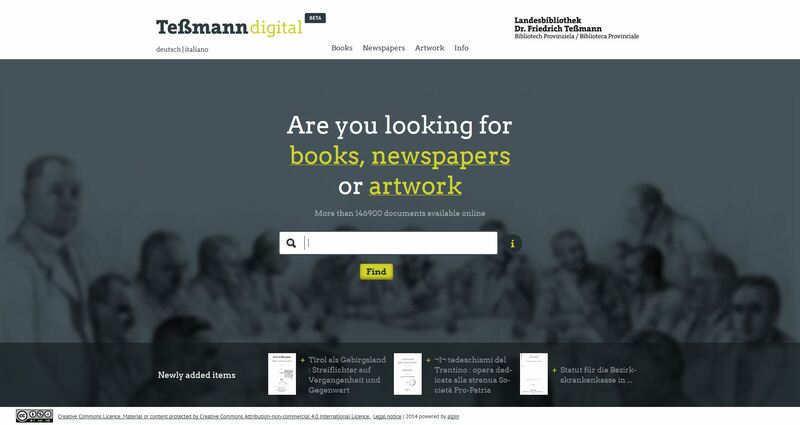 For the digital editions of the last decade, the Teßmann Library could also count on the collaboration of publishers. Every year up to 1,000 newly digitised works are loaded into the portal. You can view them in low resolution (Standard view) or in a slightly higher resolution (PDF view). In the Dr. Friedrich Teßmann Library on-site, you also have high-resolution files (TIFF view) of the digitised newspapers and books at your disposal for non-commercial use. These contents are accessible exclusively locally on the Teßmann Library’s intranet. OCR-indexed means that the complete text of the works has been recognised with a so called OCR software (OCR – Optical Character Recognition), allowing a full-text search based on keywords. Most of the works in the sections “Books” and “Newspapers” have already been OCR-indexed. During the process of automated text recognition, some factors can complicate the correct recognition of the source text, like the font (e.g. German type) or the state of the scanned material (thin, transparent, dirty, yellowed or damaged paper, dust particles or little hairs on the microfilm images, very tightly bound books etc.). Thus, the results of the automatic character recognition do not offer absolute compliance with the texts of the original documents. This can also affect the search accuracy of a full-text search in our portal. or the Search bar in the header of the “Newspapers” or “Books” sections, you can search within the OCR-indexed documents. On the menu access pages „Books“ or „Artwork“, you can search for works following the predefined Categories. Using the Advanced Search you can search by the so called metadata of a work, like author, artist, title, year of publication etc. Moreover, you can fullfill a Quick search by title/keyword and names of persons in the search bar in the header of “Artwork”. In the section “Newspapers” you can search for a specific newspaper in the list All newspapers…. …or you can click on the button View all issues of all newspapers and choose a specific date in the Annual archive to see all issues of that day available in the portal. You can further limit the hits you got in the Full-text search or the Advanced search by choosing different Search filters like type of media, title, year of publication, author, language etc. Moreover, you can view your hits by relevance, year of publication, title A-Z or Z-A. In 2006, the Dr. Friedrich Teßmann Library began to digitise its historical newspaper collections from the Alpine region, and made them accessible in the Library’s intranet in 2007. The main motivation was on the one hand to preserve the cultural heritage and protect the originals, and on the other hand to offer the users easier access through one single portal. der to provide newspaper collections that are as complete as possible, also materials of our partner institutions and of private collectors have been digitised. The amount of digitised newspapers kept rising, and thus, the Library decided to present them in a separate internet portal. The so called “Digital Newspaper Archive” was developed and put online in 2008, giving access to more than 20 newspapers. In the beginning the focus lay on works from the 19th century, but by now also more recent newspapers like “Dolomiten” or “Neue Südtiroler Tageszeitung” are provided. For copyright reasons however, the issues of the last 70 years of these newspapers are solely accessible in the Library’s intranet. At present, there are more than 40 newspapers available in the portal which corresponds to more than 1.5 million digitised newspaper pages. In 2012, about 1,200 digitised books, that is mostly Tyrolean literature from the 19th and the early 20th century, and 1,600 pieces of artwork from the Teßmann collection were made available in the portal and the navigation was adapted accordingly. On 1st August 2012 the “Digital Library” was put online. Since then, further 3,000 works have been loaded into the portal. Since the offered scans of newspapers and books on the portal were simple image files, they could not be searched through for keywords but had to be paged through one by one, just like their originals in paper. 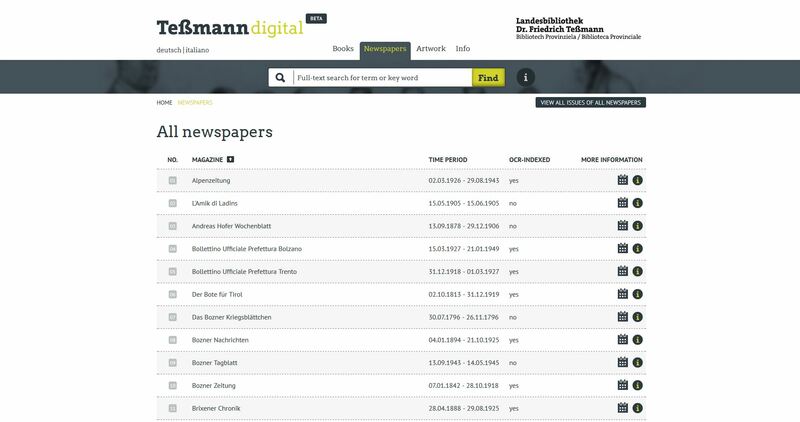 After 2012, the Teßmann Library sought to realise the automated text recognition of the newspaper and book collections and worked with Alpin GmbH to further develop the portal and the implementation of full-text search. The result of this endeavour is the current portal “Teßmann digital”.